My latest PopMatters article is now life: Finding a Place for Impact Games. I should say right now, after today, I deeply regret the title of this piece. Really, the issue concerning social impact games isn't about "finding" a place at all. We already found a place for these games, it's right next to all the other games we play and consume on a day-to-day basis. They can find a place on Kongregate, or their own websites, on consoles or on handhelds, or even on the websites like the New York Times. No, this is more about demanding their rightful place in our gaming culture, not "finding" one. I went to a GDC talk today, the last of the Game Design Challenges, which for the past ten years have asked designer luminaries to invent game design ideas around simple themes, from love to religion. The host and creator, Eric Zimmerman, is bringing the series to a close this year rather than hand off hosting duties to another person. While I suspect he just doesn't want to participate anymore, he reasoning is that there is no need in today's game design environment for thematic challenges. As he states it, "games have arrived." Maybe I just haven't been paying attention, but where exactly are we and when did we get here? When did game design stop being a process and become a destination? When did we all decide that, well, games are accepted "enough" that we can stop outrageous imaginings because we'd achieved our goal? Have authors, of either fiction or non-fiction, stopped imposing challenges on themselves? Have film-makers given up experimentation and exploration of controversial themes because some famous director took home an Oscar? The idea that games have "arrived" isn't just short-sighted, it's offensive. There are people who have dedicated their lives to making games that change the lives of people half-way across the world. There are people brazen enough to make deeply personal games, or games about real life, in an effort to educate or criticize. But at the same time, their work is being sidelined, quietly ignored, and fought over. Critical and radical game design is a challenge, a daily struggle, and we have a long way to go. We shoot ourselves in the foot to believe for a second the fight has been won. Well, enough with the short rant. 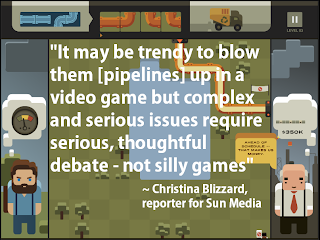 I do want to add that I was deeply shocked at TVO's decision to remove Pipeline Trouble from the game. During my masters study, I interviewed the team behind Inside the Haiti Earthquake, another game that sought to model some of the systems of aid relief as a companion to a documentary on the subject. The game designers were given a rare opportunity to delve into real world systems within digital systems, all while receiving liberal funding and with the support of the documentarians. The result is, in my opinion, an excellent example of documentary game design. 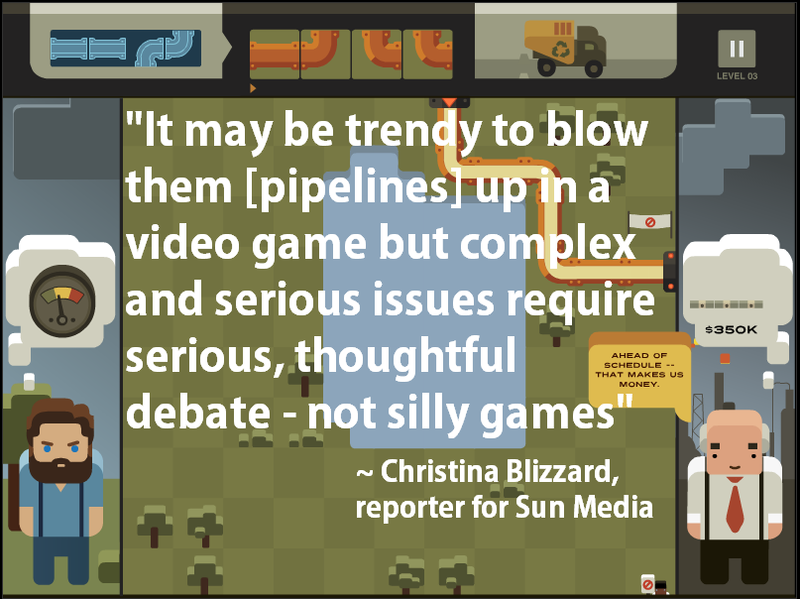 The decision to pull Pipeline Trouble shows a reactionary organization in which game designers are liabilities. I seriously doubt game design experimentation under the TVO umbrella will recover from this event unharmed. This might not mean much to a lot of readers, but this is tragedy for the already vulnerable impact games community. Interesting to read Zimmerman saying that when Rhianna Pratchett said in an interview that she believes that the gaming industry is only now really willing to experiment and go out on a limb with the mainstream games, especially in dealing with things like gender, race, social justice. I have to agree with you in terms of this whole "destination" thing. Has there always been this end game? Why does there have to be this end game? Almost as if we've finally walked through the tunnel and into the light, but that's not right really. The journey, the subjects, the examinations never really end. If we've reached the pinnacle of one point, then push it to the next...there is always another pinnacle to reach. I really wish you had come to your master's with my cohort! Would have loved to have had someone else to talk games with. Wrote a paper for Kidd on social justice gaming, but that was an interest I had just learned about games, not nearly the level of work you already came in with. Love reading your work all the time.